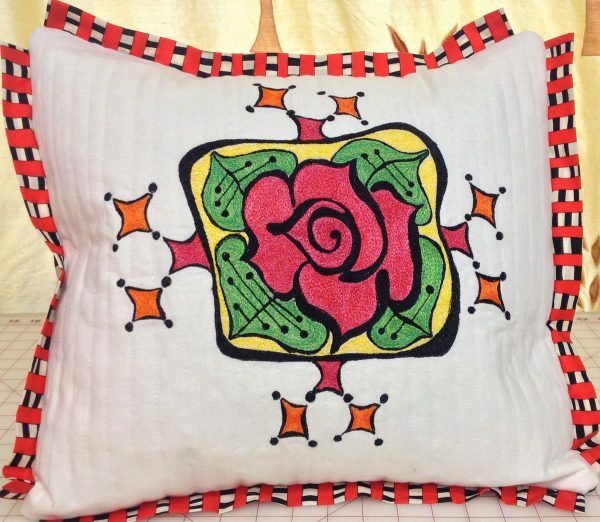 This Thread Painted Rose Tile Pillow project comes from our BERNINA Ambassador Terry White, and is reminiscent of early 20th Century Arts and Crafts designs. 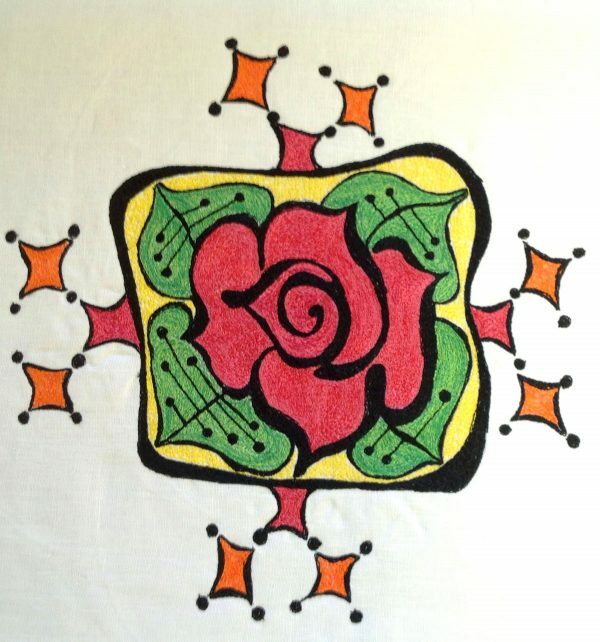 Here is my “Rose Tile” design. It is my version of a design popular in the American Arts and Crafts Movement. 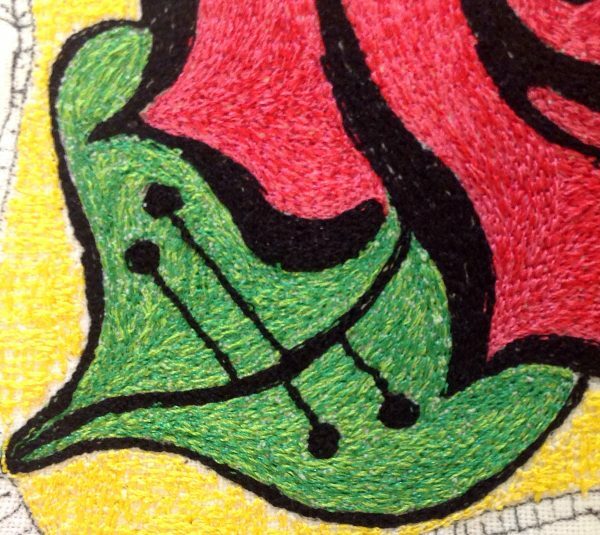 I enjoy using historical embroidery design ideas and draw them in a new way for my thread painting work. I love to study historical and world embroidery forms. I learn so much about how the design ideas work with the materials and techniques. The Arts and Crafts movement, which began in England and then came to America at the turn of the last century (not this one), was a creative movement born out of the desire to keep the artists hand in the work…a reaction to the Industrial Revolution. This is a fairly simple thread painting project. The threads I used for this design are Trilobal Polyester threads. I love this type of thread…you get a clean hard edge and sheen…and they behave very well when thread painting. For this design, I used two threads through the eye of the needle. This is a technique I have been using for many years. By using two threads you create an almost iridescent effect…a very rich look. 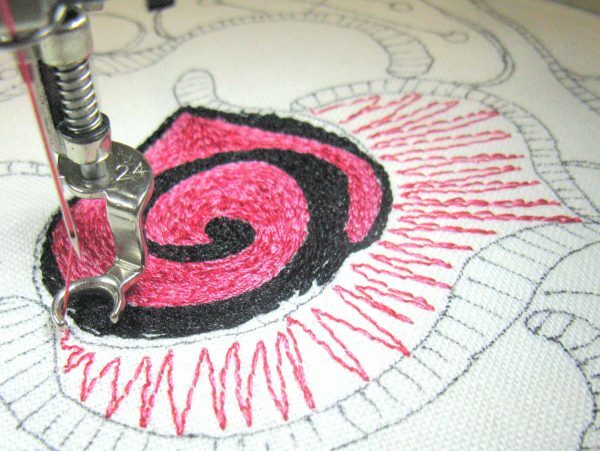 Also, it bulks up the stitch which creates a fuller raised texture to the work. So, I used two different colors of red together…a rose red and an orange red….to get the rich color tones. For the leaves I used two different greens. The idea is to use two shades of the same color with the same depth of color to create a subtle color mix. Basic thread painting skills are needed for this project. 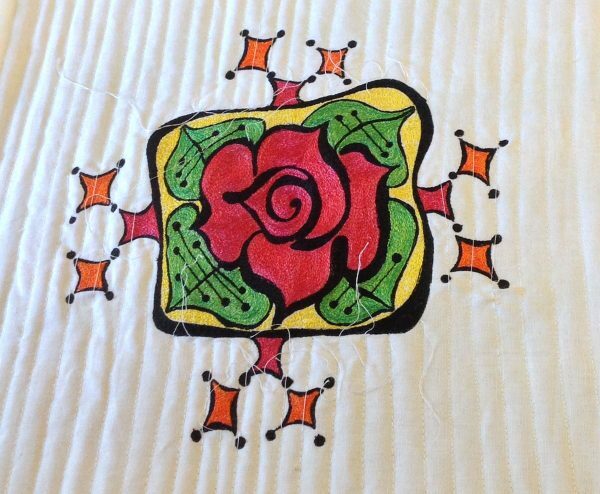 The design is stitched on white linen and then quilted with white machine quilting cotton thread. 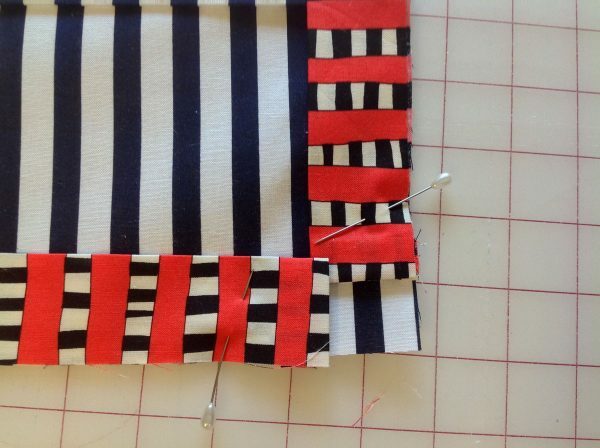 The quilting is done with white cotton thread in lines which are not perfectly parallel. Trace the design onto prepared linen with a black archival quality pen. I use a light box. I have used dash marks in the areas of the design that will be stitched in black. This helps me to see the design better. Hoop the fabric and the stabilizer together. Use the small hoop on top and the large hoop on the bottom so that the fabric is against the machine bed. Be sure to hoop it tight. I am using two threads through the eye of the needle. Thread them through the machine as if you were using a twin needle (check your sewing machine manual for threading sequence). Then, thread them both through the eye of the 90/14 machine embroidery needle. 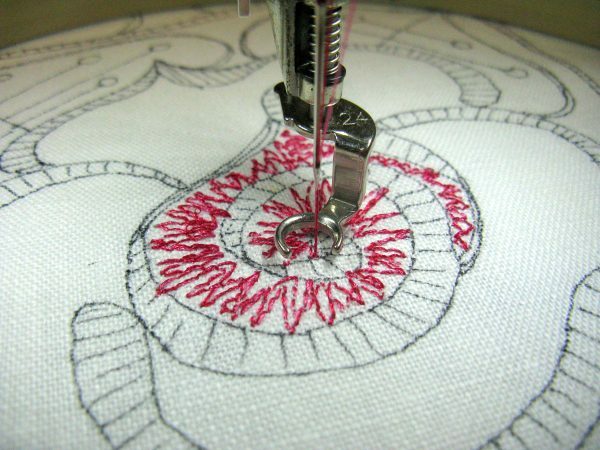 The large eye of the needle will handle both threads. Start with Red and Pink threads together. There is not a high contrast between these threads, so they will blend well. In the photo, you can see that I’m using an underlay stitch. This does two things: it pads the stitch; more importantly, it helps to prevent distortion of the fabric. Without the underlay stitches, when stitching densely in one direction, the fabric will distort and the design will undulate. 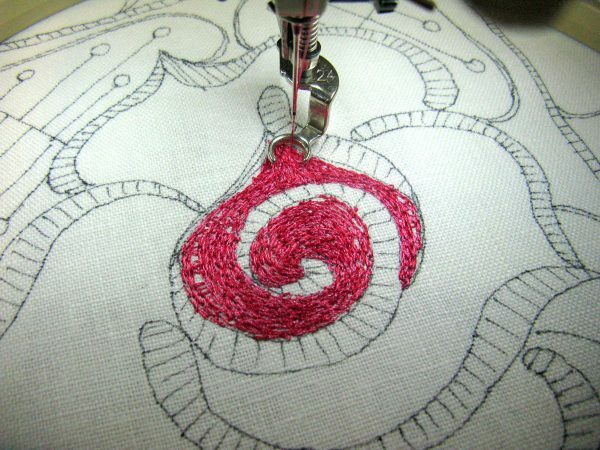 Stitch with long stitches to fill the areas by stitching along the contours of the shape. 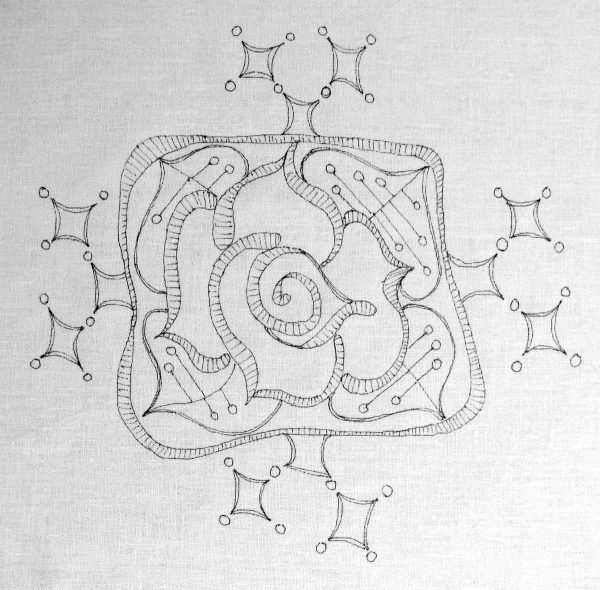 The design is made interesting by the direction of the stitches. The threads are solid colors, so the directions of the stitches create texture (as in all textile work). The way light hits the work enhances the design by the shading caused by the intense reflectivity of the threads. 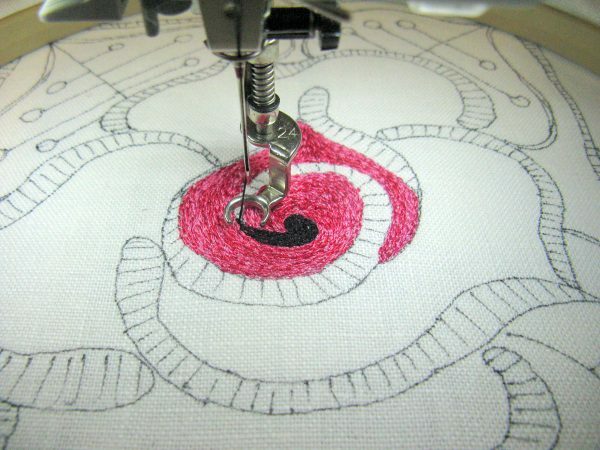 Then, overstitch with the Pink thread ….a single thread for shading. In this photo, look at the subtle shading of color. The overstitching with the pink is done with long, swooping stitches, just enough to add areas of shading…not a lot of stitching. Black bobbin thread is used with the black thread. Stitch with two black threads…you can wind thread on a bobbin and use it as a regular spool of thread. 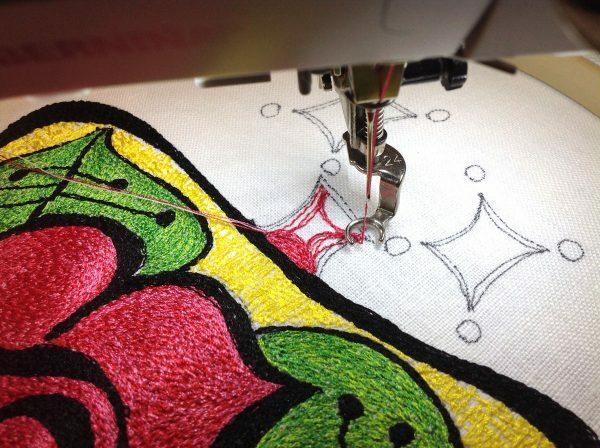 Smooth contour stitching….stitch small sections at a time to help prevent curling of the work. One of the nice aspects of this design is that the black lines flow thick and thin….so, if you “go out of the lines” it won’t matter and the fix is easy….just stitch some more and make it a thicker line! Use two greens for leaves. Overstitch with one green for shading. Look at the black dots in the leaf. This is a French knot. It is made by spiraling in and spiraling out like a very tight spiral. 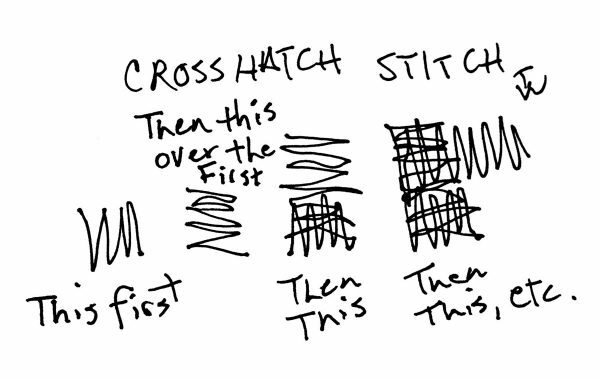 The drawing shows the sequence of the Cross Hatch stitch. Crosshatch Stitch with a cross hatch stitch. I used two threads of the same yellow color. The cross hatch stitching does not completely cover the linen, so the white fabric is my second color. 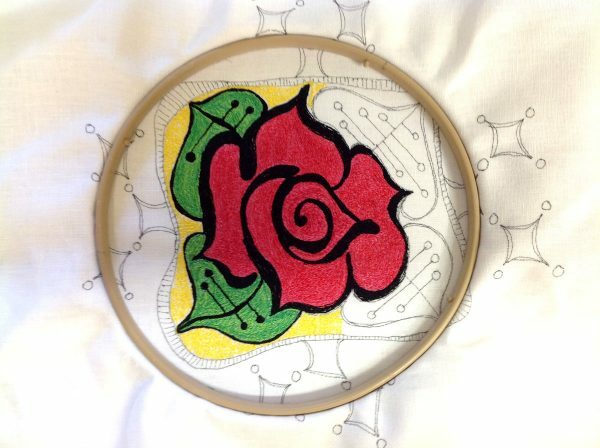 It’s time to re-hoop…I like to stitch the design in the hoop, re-hoop, and stitch another section of design. I iron the hoop dents out before re-hooping. Okay, so they aren’t exactly squares, you could say that they are lively square-like shapes. The dots are French knots. Press the panel when the thread painting is done. I quilted in straight rows with the cotton thread. I like the contrast between the plastic look of the polyesters and the natural look of the linen and cotton quilting lines. For quilting straight lines, I like to use a BERNINA Differential Feed Foot such as Patchwork Foot #97D. It keeps all the layers moving together. You may prefer using the BERNINA Walking Foot which is what I always used before I had a BERNINA Sewing Machine with Differential Feed…which I love, love. This is finished into a pillow. For the edge trim, I cut four 3 inch strips of a print, folded and pressed them each in half long ways. 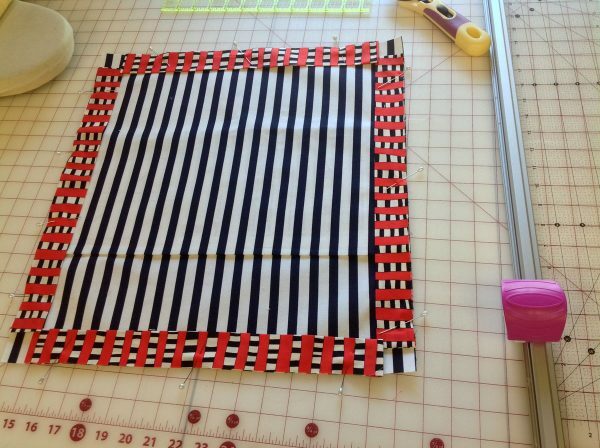 I finished the ends with fusible web strips. Then, I stitched each edge trim to the four edges of the pillow back…right sides together. Note the corner treatment. 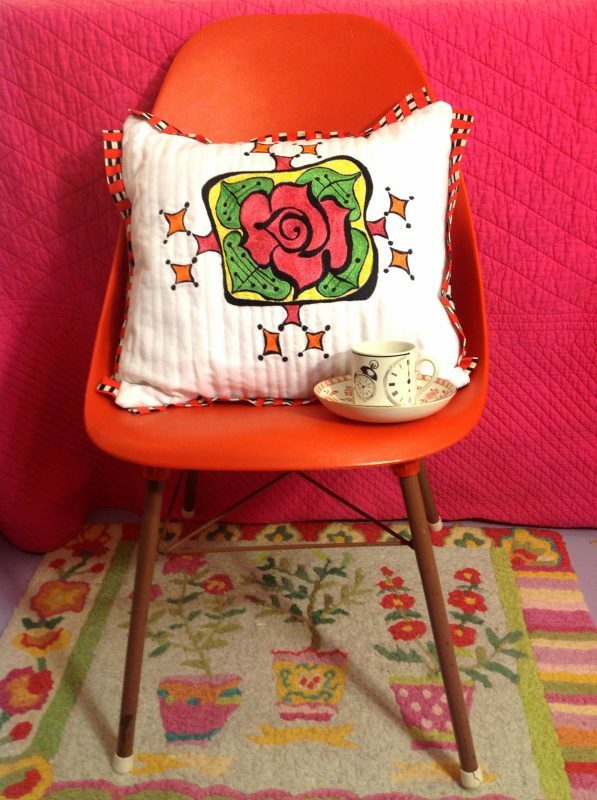 Stitch the back to the front…right sides together, turn and stuff with a pillow form.